QEnergySpa, BEFE Dilution Factor - Q the Experience, Future Life Science. QEnergySpa, BEFE Bio-Energy Dilution Effect. Bio-Energy Dilution is the term associated with the dilution of the bio-energy present within the water as it extends to the extremities of the body away from the water module. The Dilution factor is determined by how much of the body is immersed into the water, how much water is being used and the total body weight. Although there are optimal levels in the correct use of the QEnergySpa, BEFE in this regard, we recommend for the use of as much or as little water as you feel comfortable with, at the temperature that you prefer as the differences between that and the optimal levels are small and in some cases inconvenient as well as the fact that the body will still equalise for some time after the session to the point where the entire body will have received the boost in energy. In other words, even if only a very small body part was immersed, the energy will fully traverse the entire body and the whole body will therefore benefit regardless. Any part of the body which is not submersed into the water, will be energised through the part which is submersed, much like a domino effect from cell to cell throughout the body and hence the furthest point away from the water is energised to a lesser extend during the session. During the following 40 hours afterwards and until the next session, all bio energies absorbed by the body will equalise throughout the body as the body adjusts and utilises the energy in its normal day to day function. Hence, the entire body will benefit greatly from the overall bio-energy transference, no matter how much or little is directly immerse into the water with the QEnergySpa, BEFE at any one time. Where the dilution factor or effect become significant, would be in such instances where you wish to assist the body to cope with an injury, whether new or old. In this instance, you should immerse that particular body part into the water for maximum benefit and it should be done a soon as possible after the injury as in within the next 20 minutes. Figure 1, shows how the dilution effect decreases with the more body weight immerse into the water with the QEnergySpa, BEFE. Immersing your whole body gives you no dilution or a ratio of 1:1. Inserting ½ your body will give a ratio of 1:2 or ½ diluted at the extremities. however, should you only insert your hands, then the dilution would become 1:83 at your body extremities. In short, in order to increase efficiency and charge rate, we recommend that you maximise the percentage of your body mass in the water and or minimise the amount of water for your body weight as demonstrated in Figure 2. The higher the dilution factor as shown above, the less the efficiency of the QEnergySpa. However, the water volume also affects the efficiency. The ideal volume of water to body weight ratio is 3.5 litres of water per kilogram of body weight. Once this volume is exceeded, the efficiency will decrease. Simply multiply the body weight by 3.5 and that should be the number of litres of water used for that body. 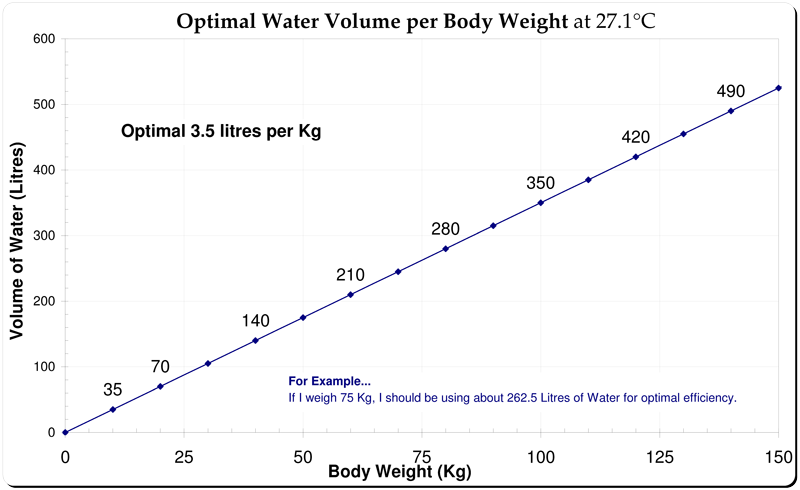 Use figure 2, below for a quick estimate of the water usage for any particular body weight and obviously if the use of partial body immersion is used, then the water volume is even smaller, but the same ratio applies, you may have to estimate the weight of the body part you submerse in the water. If you only submerse half the body into the water, you should only need to use half the volume of water than you would for a full body immersion. The use of less water. Due to the shape and sizes of various bath tubs or containers that you may use, your estimate of water volume may be less than the optimum water volume as indicated above. This is generally not a problem as the effect of lessening the volume of water in relation to the body weight, increases the charge rate to the body. Normally this is quite acceptable and will only serve to increase the bio-energy absorption by the body. However, it may not necessarily be acceptable to everyone and in that event, the tables above should be more strictly adhered to. The use of too much water. What happens if the water volume per body weight exceeds the ratio of 3.5:1 ? Say you were to double the water and you would now be using a ratio of 7 litres per kg of body weight. In this case we have just reduced the effectiveness of the QEnergySpa by 50% as shown in Figure 3. If for example you were to immerse one foot in 7 litres of water and your foot weighed, say 2kg and your total body weight was 60kg, the dilution factor would be 1:30. That means that the Bio-Energy efficiency would be one 30th less at the extremities of your body compared to the body part immersed and if you weighed 120kg the dilution factor would be 1:60. If however you were to immerse both your feet into the water, weighing, 4kg and you were using 7 litres of water, because your weight is 60kg you would only have a dilution factor of 1:15. An extreme example of the dilution factor would be if you only put your little finger, weighing 30 grams, into the water. If your weight is 60 kg, the dilution factor would be 1:2000. A dilution factor of 1:2000 may seem extremely small, however, if any part of your body is immersed, your whole body will still benefit. You cannot say that your body is only getting 1/2000th of the benefit, because that is not the case. It will equalise. The Bio-Energy enhancement efficiency in the water is diluted when increasing the water volume in excess of your body weight as per the above figures. 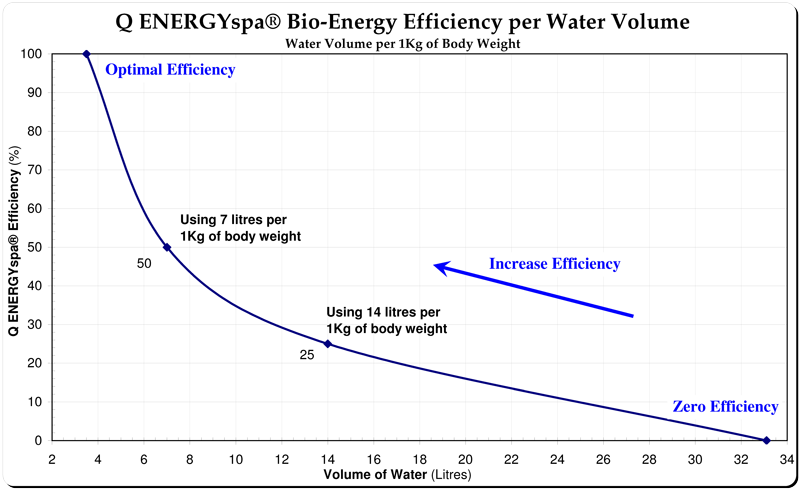 When the volume of 33.1 litres of water per kilogram is exceeded the efficiency of the QEnergySpa is effectively equal to zero as indicated in Figure 3.